Scenic Hills is a quaint 55+ community located in Schertz, Texas. With just 204 homes, this active adult community provides a small and friendly neighborhood where residents become fast friends. Scenic Hills also boasts an envious line up of amenities sure to keep homeowners physically and socially active. At the center of the community stands the 13,000 square-foot clubhouse called The Lodge. Residents can stay in shape in the exercise room. An arts and crafts studio is on hand for picking up a new hobby while a multi-purpose room serves as a gathering point for meetings and events. The Lodge also offers a library, ballroom, card room and a billiards room for enjoying time with neighbors. The terrific amenities continue outdoors with a pool and patio. Scenic Hills offers two tennis courts, four shuffleboard courts, and horseshoe pits for some friendly competition with neighbors. A gazebo is perfectly situated for enjoying a quiet afternoon after a stroll along the walking and biking trails. You can also avoid expensive storage fees because Scenic Hills provides R.V. parking. Scenic Hills was developed by U.S. Homes between 1982 and 1989. These homes range in size from 1,294 to 2,270 square feet and offer two to four bedrooms, one to three bathrooms, and an attached two-car garage. Some homes feature open floor plans, Corian countertops, plantation shutters, and a few boast terrific views of the neighboring golf course. Residents will also have more time to spend as they please because the homeowners' association takes care of common area maintenance, guard service, lawn care, and the underground sprinkler system. Living within Scenic Hills means having access to a wide range of social and physical activities. Stay in shape with tennis, line dancing, and water aerobics. Learn a new skill with the stained glass, painting or quilting club. Meeting new neighbors or catching up with old ones is easy with happy hours, potlucks, and coffee call. There are also ladies' luncheons, dominoes, and golf outings to fill your days. From cowboy breakfasts to poker to chorus, Scenic Hills provides nearly endless ways to keep residents entertained and busy. Scenic Hills is located in Schertz, Texas, just 25 miles from San Antonio and their international airport. Interstate 35 is just down the street. Bussey's Flea Market, Walmart Supercenter, and Lowe's are all just a short drive away. 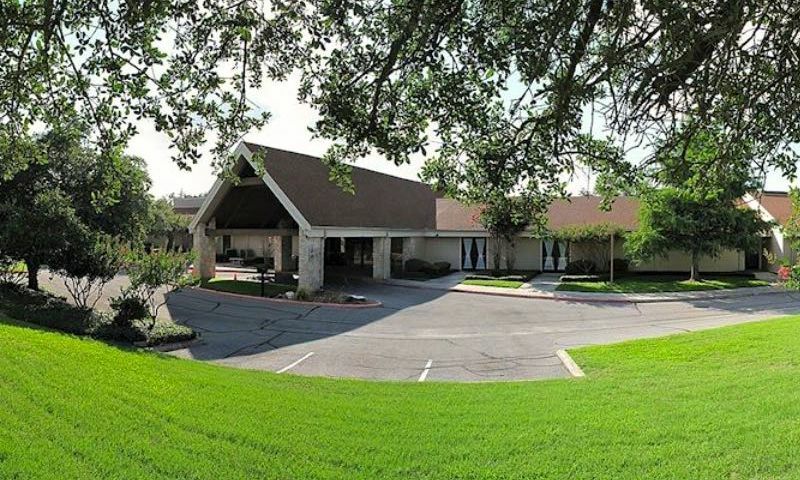 Northeast Methodist Hospital is about eleven miles away in neighboring Live Oak. For outdoor enthusiasts, Schertz has the Crescent Bend Nature Park, with several miles of trails and fishing areas on 190 acres. Next door to the community is the Northcliffe Golf Club. There are also several shops and restaurants in the immediate area and when you want big city attractions, San Antonio is just a short drive away. Scenic Hills has all the amenities and in a desirable area, making it a terrific active adult community in Central Texas. The Lodge - 13,000 Sq. Ft. There are plenty of activities available in Scenic Hills. Here is a sample of some of the clubs, activities and classes offered here. Scenic Hills was developed by U.S. Homes between 1982 and 1989. These homes range in size from 1,294 to 2,270 square feet and offer two to four bedrooms, one to three bathrooms, and an attached two-car garage. Some homes feature open floor plans, Corian countertops, plantation shutters, and a few boast terrific views of the neighboring golf course. Please Note: Floor plans are not available at this time. 55places.com is not affiliated with the developer(s) or homeowners association of Scenic Hills. The information you submit is distributed to a 55places.com Partner Agent, who is a licensed real estate agent. The information regarding Scenic Hills has not been verified or approved by the developer or homeowners association. Please verify all information prior to purchasing. 55places.com is not responsible for any errors regarding the information displayed on this website.